Elementary Science Methods is an undergraduate pre-service teacher course taught by Dr. Anthony Petrosino at The University of Texas at Austin. The course has two sections, with a total of 24 students who will soon be entering their first year in the classroom as elementary teachers. The course teaches the theoretical foundations of science education for kindergarten through 5th grade students as well as providing practical experience practicing and planning learning experiences. A focus of the course is how teachers can learn and teach about complex scientific phenomena. Topics that until recently have been considered out of reach by younger audiences. During the last two class periods before spring break, students enrolled in the class engaged with the group-based cloud computing simulations modified from the Wolf Sheep Predation model to learn how the human-nature interactions in Yellowstone triggered massive geological changes to the path of rivers (Wilensky, 1999). On day one of the lesson, students reflected on the uses of models and simulations in teaching their future students science. Students were able to engage with some state-provided assessment items regarding food chains, food webs, and ecological vocabulary. After reflecting on the types of knowledge represented in these state-assessment items, students watched the video How Wolves Change Rivers. Following the video, students discussed the differences in the complexity, rigor, and engagement between what a common state science test assesses, and the real ecological problem demonstrated in the video. Students decided that the video demonstrated scientific content that was much more rigorous, contextualized in a real problem, and much more interesting. Students were asked to complete a concept map showing the multiple organisms and processes involved in what we call The Yellowstone Problem. On day two of the lesson, students brought in their concept maps and reflected on some of the major trends amongst their peers. At this point, the GbCC Wolf-Elk Binary model (a modification of Wilensky's Wolf Sheep Predation model, generated by Mica Kohl, an undergraduate Computer Science Student) was provided to students and they were asked to play. Students took naturally to working with the models and quickly uncovered the sharing features and the original NetLogo code. After discussing the affordances and limitations of the model, students were provided another piece to the story - how aspen height affects the grazing of elk. 4. The sharing feature is nice, but it would be better if they could share and send a comment for why they are sharing. Overall, the pre-service teachers who participated were eager to learn more. We hope these will soon be teachers in the classrooms we can collaborate to build models for expanding their classroom's teaching and learning potential. One team of students' planned a modification to the GbCC model which would incorporate Aspen Height as an important variable in Elk grazing. 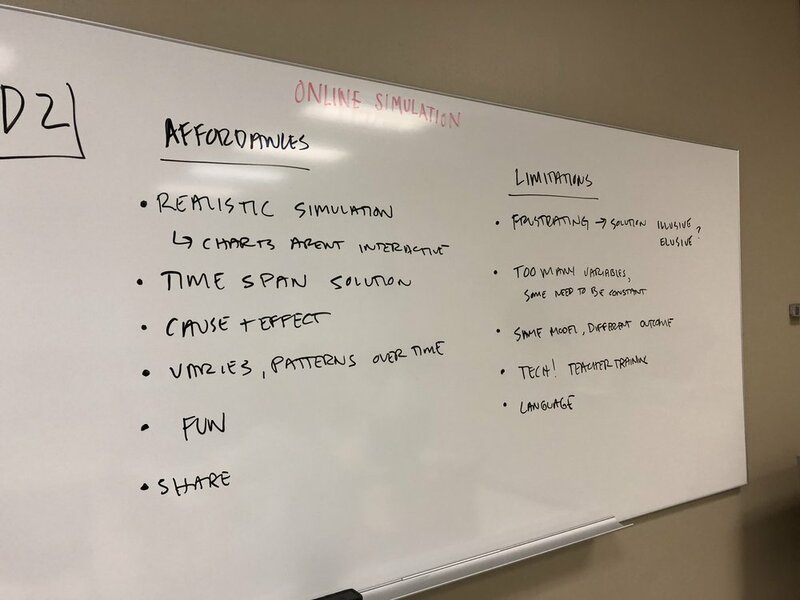 Teacher generated list of affordances and limitations of using online, fully authorable, GbCC simulations in class.